This is my first summer growing anything other than tomatoes in my garden. Last Friday, after several days of neglecting my vegetable plants, I went out to check on them. 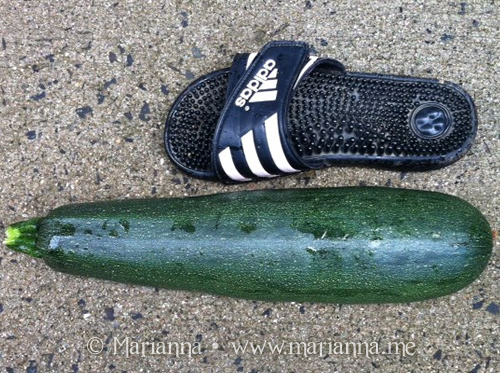 And frankly I was shocked at the huge zucchini I found there. I have gotten oversized zucchini from our CSA before, but nothing like this. For comparison, here it is next to my size 8 sandals. On Saturday we cut it up, put some olive oil and garlic salt on it and threw it on the grill. It was delicious. Looking forward to many more! 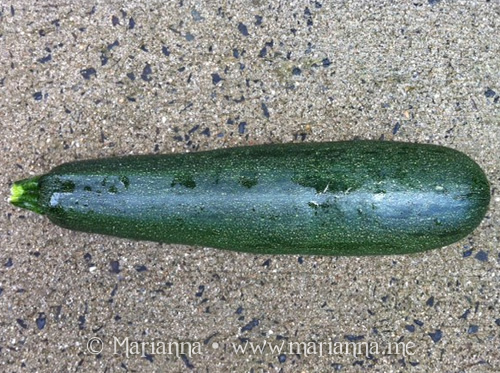 Everyone I know that has grown zucchini this year has had some massive ones! Wow putting it next to the shoe definitely showed it's size!!! Crazy! Holy Moly! Whatcha making with it? Doh - just read the words, you grilled it :) Silly me! We have had some ridiculously big ones too! Isn't it crazy how quickly they get huge?! You can send some over to me. Love zucchini sliced up in my salad. Whoa! You'll have to choose a special recipe for that one! WOW. What kind of fertilizer do you use? LOL. We need some of that in our garden. That is so big. We had a few like this. Yummy! Yum! That's one nice looking zucchini! I only planted one this year but I've gotten a few nice size ones from it, hey are so good! WHOA! Can definitely see just how big it is when it's next to your sandal! OMG That is one large zucchini. That's huge! I just bought some zucchini, I've never had it. YUM!!! I love that about growing your own foods! Make some zucchini bread with your next one - SO GOOD!! Wow, that is awesome! I love zucchini! Holy cow! That's one HUGE zucchini!! Good grief that thing is huge. 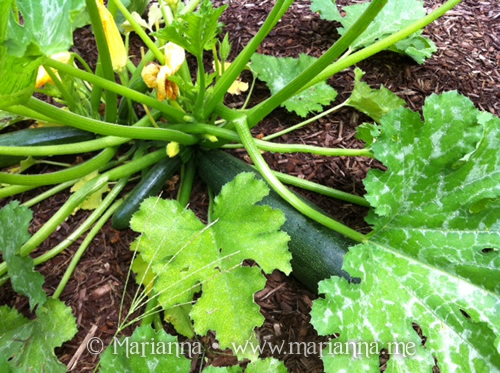 I'm glad you posted this because now I know for sure what I'm growing is not a zucchini.